RO*TEL is the original Texas family recipe that originated in the Rio Grande Valley. Plump, vine ripened tomatoes blended with select green chilies and flavorful spices, ROTEL adds zest to any dish calling for tomatoes. Use with Velveeta cheese for a great, time tested, dip recipe. Item # 501 "HOT" (habanero peppers) Used to be the "Extra Hot"-same recipe. The very best in dried corn flour used in making corn tortillas, gorditas, puffy tacos, and tamales. Mix with water (and optional lard and salt or spices) to get the next best thing to fresh ground masa. Also a great thickener when mixed with water for chili. Once you try these your bean sorting days are over !! Rosarita Refried's are great to use when you can't make your own from scratch. Use them on burritos, tostadas, tacos, dips, nachos, or just as a side dish. Simply add a little water and simmer for 15 minutes. Rosarita -the heart of the Mexican meal for over 50 years ! The recipe that made Ranch Style famous. Born around a campfire over 60 years ago, this authentic blend of Wild West spices and premium pinto beans became a legend with trail cooks and backyard cooks alike. How long has it been, neighbor ? Well, due to many requests from our customers, here it is-WOLF BRAND CHILI !! 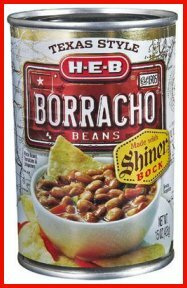 A staple in Texas pantries since 1895 when it was invented. These are the real deal, partner !! Mild in flavor, you can eat these right out of the can. Even better, refrigerate 'em and compliment just about any dish with the great taste of these pickled jalapeños. Great on nachos and even compliments a bowl of black-eyed peas. These will have the back of your neck moist within no time at all. Best when refrigerated after opening in an airtight container. Copyright 1998-2015 "Secrets to Cooking Tex-Mex/Michael W. Ludwig. All rights reserved.